There are so many gorgeous sites in Burgundy, but I just have to single out the castle of Rochepot. This is partly because when it first comes into view, everybody in the car -- including the children -- literally gasps. Even though we're so used to castles that we're practically castled-out, still, there is something about this one on the horizon over this little town that makes us feel like we're in a storybook. It is a classic, medieval, 13th century castle: drawbridges, turrets, arrow slits. You can easily imagine the knights riding their horses in and out of here. For a 800 year old castle (built on the remains of a previous castle, mind you), it's in pretty great shape, and of course it helps that it was renovated in the 19th century. In 1403, upon his return from the Crusades, the Seigneur Régnier Pot (Chamberlain of Duc Philippe II de Bourgogne and also a Knight of the Toison D'Or) bought the castle, then called La Roche Nolay, and renamed it after himself. In the 16th century, the Marshal of France Anne de Montmorency bought it to go along with the more than 130 castles he owned. In the 17th century, a Cardinal bought it and in 1644 sold it to a knight who also happened to be the First President of the Burgundy Parliament. In 1893, the wife of then French President Sadi Carnot bought the ruins for their eldest son, a Colonel of the Infantry, who took 25 years to restore it to its 15th century appearance. And though the shape and the castle itself is beautiful, undoubtedly Rochepot's most outstanding feature is its tile roofs. It's the best and most beautiful example of the classic Burgundy tile roofs that I see in the region, though I must admit I still haven't checked out the famous spots in Dijon and Beaune. I don't see how they could top these toppers, however. The view from the castle isn't bad, and neither is the interior, but it's really the tiles that are the big draw. 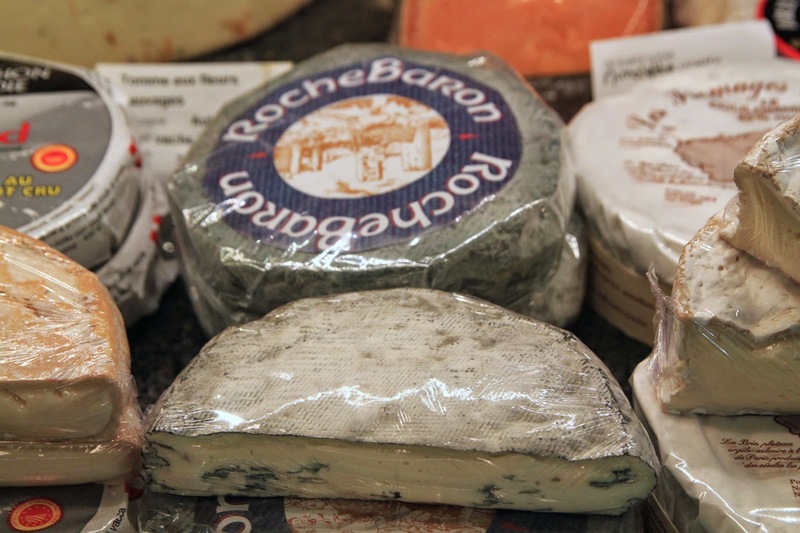 RocheBaron (Baron's Rock) is an industrial, pasteurized cows' milk cheese from the department of the Haute-Loire in Auvergne, in central France. It's a cheese with a "pâte persillée", meaning that it's streaked and dotted with blue molds. 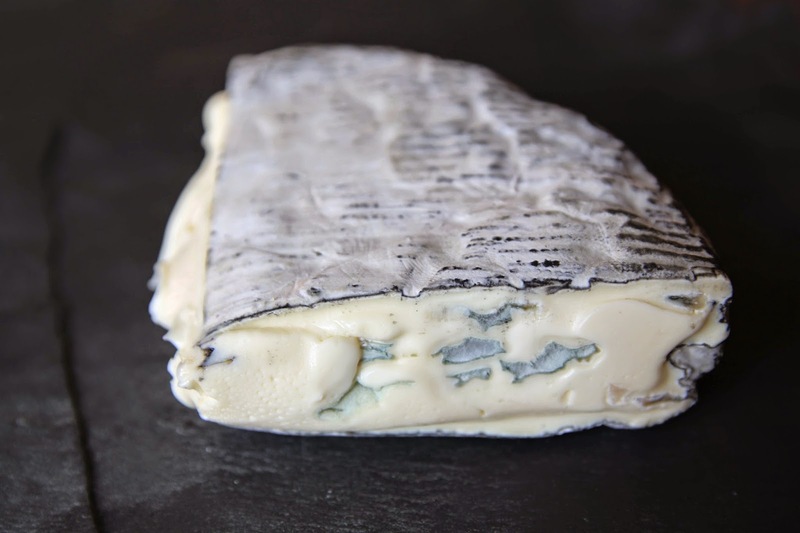 In this case, it's got a texture much more like a Camembert than a blue cheese, and even the flavor has a high proportion of buttery cow's cheese and only a small proportion of blue tang. It's like blue cheese lite -- not in terms of calories or fat, but in terms of intensity. The flavor is still full and lovely, but it's like it's not 100% blue. It's a bold cheese but a mild blue, if that makes any sense. Rochepot is named after the rock it sits on and is a residence fit for a Seigneur, a Chamberlain, a Knight, a Marshal, a Cardinal, a Fresident, and a Colonel. The cheese is a RocheBaron, named after the rocky hills in the region from which it hails, and is the cheese actually fit for a baron? Possibly not. But at least it's colorful and speckled like a Burgundy-tiled roof.